According to Statistics Estonia, in 2017 compared to 2016, the exports of goods increased by 8% and imports by 9%. In 2017, the exports of goods from Estonia amounted to 12.8 billion euros and imports to Estonia to 14.7 billion euros at current prices. The trade deficit in 2017 was 1.9 billion euros, having increased by 315 million euros compared to 2016. The increase in the trade deficit was affected the most by the imports of transport equipment (incl. ships). The largest surplus was in the trade in wood and articles of wood and miscellaneous manufactured articles (incl. furniture); the largest deficit was registered in the trade in transport equipment and in raw materials and products of the chemical industry. In 2017, the share of European Union countries in Estonia’s total exports was 71% and in total imports 82%. The trade deficit with other European Union countries totalled 3 billion euros, which is 610 million euros more than in 2016. In trade with EU countries, exports increased by 4% and imports by 9%. Trade in goods with non-EU countries grew more – exports increased by 18% and imports by 11%. As in previous years, electrical equipment was exported the most, accounting for 17% of Estonia’s total exports in 2017. The second and third places were held by the exports of wood and articles of wood (11%) and mineral products (10%). The increase in exports was mostly affected by a rise in the exports of mineral products (incl. fuel), base metals and articles of base metal (incl. metal waste) and wood and articles of wood (incl. sawn timber). The biggest decrease in 2017 was recorded in the exports of electrical equipment. The top destination country of Estonia’s exports in 2017 was Finland (16% of Estonia’s total exports). Sweden (14%) was second and Latvia (9%) third. The biggest increase occurred in exports to Finland, followed by Russia and Germany. Exports to Sweden, Mexico and Nigeria decreased the most. The share of goods of Estonian origin in total exports was 72% in 2017. In the exports of goods of Estonian origin, the largest increase was in the exports of mineral products, base metals and articles of base metal and wood and articles of wood. The exports of electrical equipment dropped significantly. The main destination countries of goods of Estonian origin are Finland, Sweden and Germany. 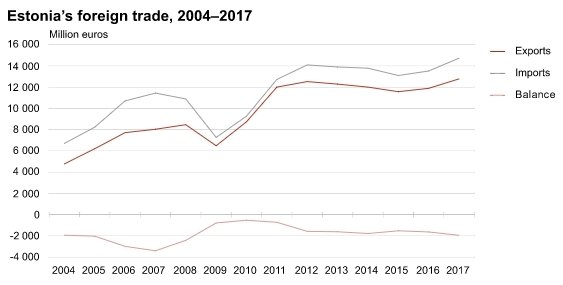 The biggest increase in the exports of goods of Estonian origin was in the exports to Germany and Finland and the biggest decrease in the exports to Sweden and Mexico. In 2017, the main commodity imported to Estonia was electrical equipment; its share amounted to 15% of Estonia’s total imports. This was followed by transport equipment (13%), agricultural products and food preparations, mechanical appliances and mineral products (each 10%). In a year, the imports of transport equipment (incl. ships, cars) and mineral products (incl. fuel) increased the most. The imports of electrical equipment decreased. The main countries of consignment in 2017 were Finland (14% of Estonia’s total imports), Germany (11%), and Lithuania (9%). The biggest increase occurred in imports from Finland, followed by Russia and Sweden. The largest decrease was registered in imports from Hungary, the USA and Canada. Estonia exported goods to 180 countries and imported goods from 133 countries. A positive foreign trade balance was recorded in the case of 130 countries. The biggest surplus was recorded in trade with Sweden, followed by Norway and the USA. The biggest deficit was recorded in trade with Poland, Germany and Lithuania. In December 2017, exports of goods from Estonia amounted to 1 billion euros and imports to Estonia to 1.2 billion euros. Compared to December 2016, exports increased 3% and imports 4%. In December 2017, the growth in exports was affected the most by the exports of cereals, and the growth in imports by fuel imports. In December 2017, the foreign trade export volume index increased by 2% and the import volume index by 11% compared to the same period of 2016.